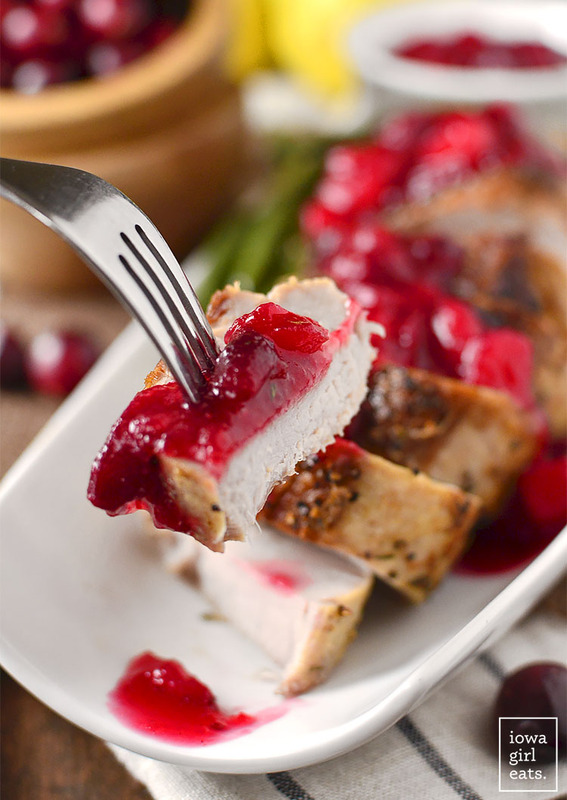 Roasted Pork Tenderloin with Cranberry-Pear Sauce is easy and filling, and features a delicious sweet-tart sauce sweetened without refined sugar! But I’m not kidding about the snow! Despite the tree + twinkly lights, graham cracker house constructing, Christmas ornament making (we used this recipe which worked perfectly!) and holiday music on repeat, the lack of snow on the ground and 50 degree days in the forecast have me wishing for that last piece of Christmas sparkle. What about you? Are you just fine without a fresh blanket of snow on the ground, or are you wishing for a little bit like me? 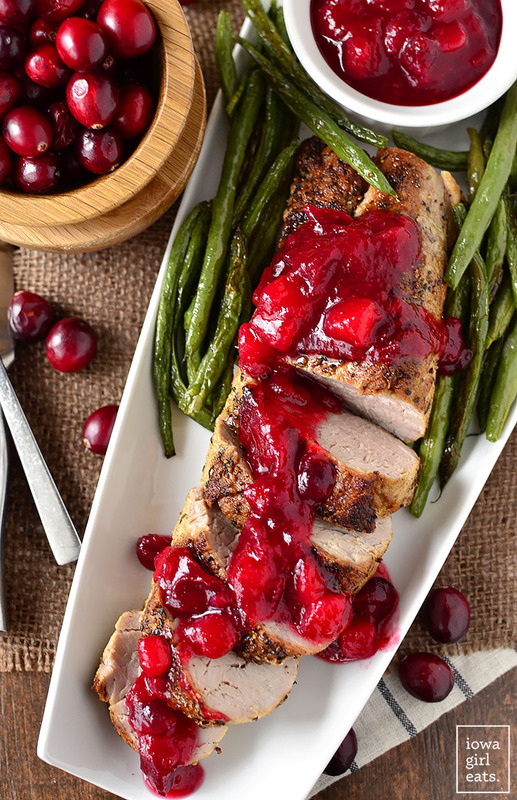 Well, if the weather isn’t going to cooperate I’m taking matters into my own hands and creating a festive dish that just screams “HOLIDAYS!” Roasted Pork Tenderloin with Cranberry-Pear Sauce is a bright and beautiful recipe to spark some holiday spirit! Cranberries are of course thought of as a Thanksgiving side dish staple, but they’re abundantly available at the grocery store all holiday season long – so much so that after the 10th time I passed by the display in the produce section, I decided to snag a bag and give this dish a go. 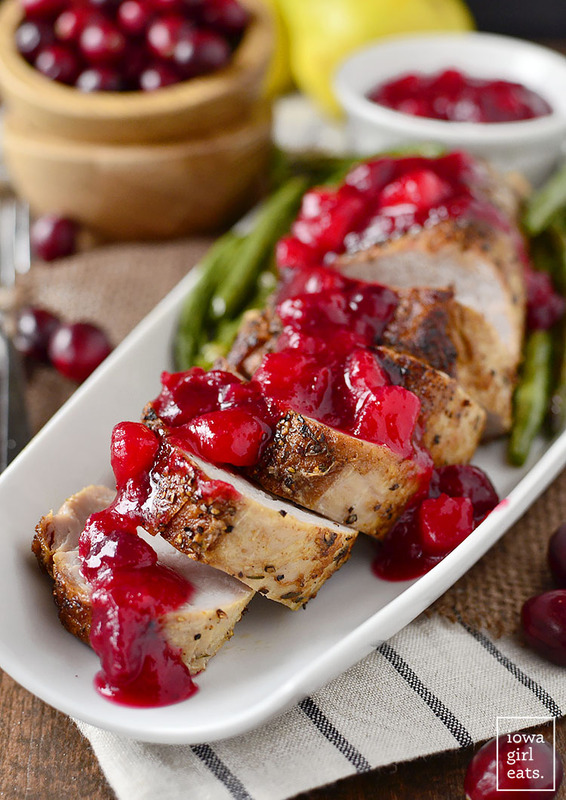 I’d never cooked with fresh cranberries and was eager to not only give them a starring roll in the luscious sauce enveloping juicy roast pork slices, but actually taste one to see how tart they really are. Whelp, everyone is not wrong – fresh cranberries are ta-ART! So tart! I can definitely see why they’re usually doused in sugar to the tune of 6 teaspoons, or 2 Tablespoons, per 1/4 cup serving in the leading canned cranberry sauce That’s insanity! 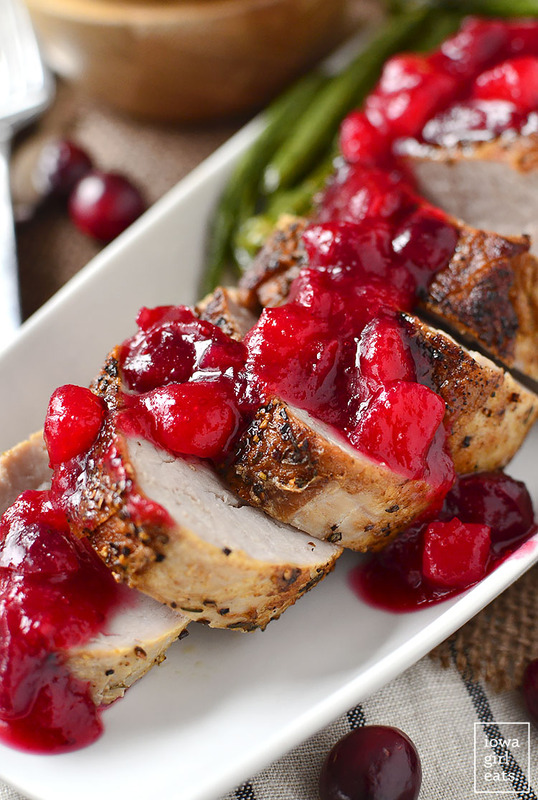 I embraced and highlighted the fact that cranberries are uniquely tart by using less than 1/4 cup sweetener in the entire recipe for the Cranberry-Pear Sauce that’s draped over with pork tenderloin, plus used naturally sweet foods like honey, fresh oranges, and ripe pears in place of white sugar. Let’s talk about the aforementioned roasted pork tenderloin! Honestly my Mom overcooked pork chops so often when I was growing up that I didn’t eat them or any other non-bacon pork products for decades. It wasn’t her fault though! Pork used to have to be cooked to a tough 165 degrees but can now be safely cooked to just 140 degrees which leaves pork tenderloin, especially, juicy and ridiculously tender. Pork tenderloin is also an incredibly economical cut of meat. They are on sale for $3.99/lb all the time at my grocery store, so I usually stock the freezer whenever I get a chance. Did I mention it’s quick cooking? Let’s slap a beard on pork tenderloin and give it a sleigh because it truly delivers, just like Santa. Now there’s a Wilson Phillips song I could get excited about! 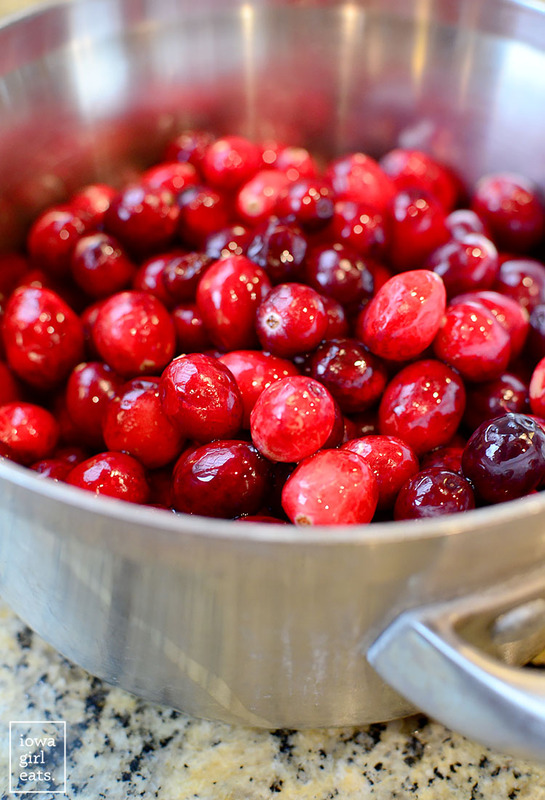 Start by rinsing then adding 6oz fresh cranberries (you could use frozen,) to a saucepan. Don’t you love their festive, ruby-red color? I wanted to string then hang them on our Christmas tree the way Jo and Amy would have done in Little Women, alas, my child would probably try and eat them. Well, just the first one. Did I mention how tart fresh cranberries are? Next add the juice of 1/2 orange, 3 Tablespoons honey, a peeled then chopped Bartlett pear, dash of cinnamon, and 1/2 cup water then place the saucepan over high heat and bring to a boil. 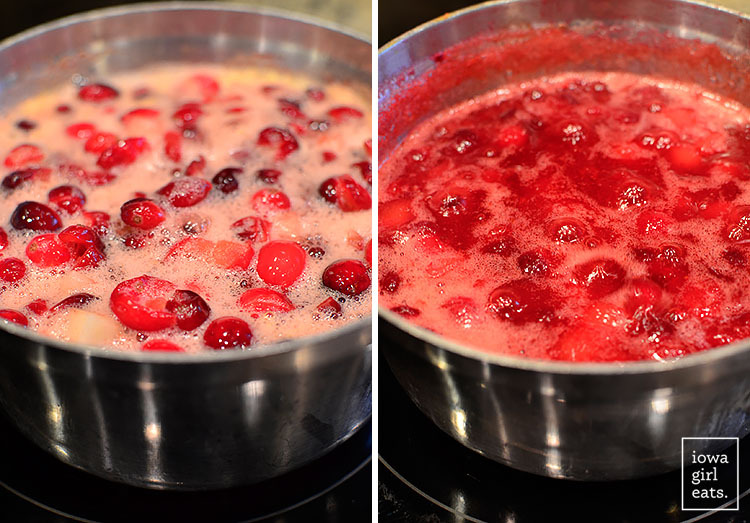 Turn the heat down to medium-low then simmer until the cranberries have burst and are tender, and the sauce has thickened, 10-15 minutes. Pour into a bowl then chill completely. You can make this sauce several days ahead of time and the leftovers taste great on everything from turkey sandwiches to ice cream. I love the balance of sweet and tart – plus again, it’s just so gosh darn beautiful. Oh, and your house will smell incredible while it cooks! Onto the main event – a 1-1/2lb pork tenderloin (not pork loin.) Like I said, this is an extremely economical cut of meat and is often on sale at the grocery store. The meat stays really juicy and tender using the sear >> roast method – you’ll love it! First trim the tenderloin of any extra fat or tissue, then season all sides liberally with salt, coarse ground black pepper (the spiciness contrasts so well with the sweetness of the sauce!) onion powder, and dried thyme leaves. Heat a thin layer of your favorite high-heat cooking oil – vegetable, almond, etc – in the bottom of an oven proof skillet (I love my Le Creuset Enameled Cast Iron Skillet!) over medium-high heat then sear the tenderloin on four sides until golden brown, 1-2 minutes per side. Stick the whole skillet inside a 450 degree oven then roast anywhere from 8-15 minutes, until a thermometer inserted into the center of the tenderloin reads 140 degrees. Transfer the tenderloin to a cutting board then let it rest for 10 minutes before carving into fat slices, and serving with the Cranberry-Pear Sauce. Feast with your eyes, then with your fork! Preheat oven to 450 degrees. Season entire tenderloin generously with salt, pepper, onion powder, and dried thyme. Add enough oil to a large, oven-proof skillet over medium-high heat to thinly coat the bottom then add the seasoned tenderloin and sear on four sides until golden brown, 1-2 minutes per side. Place skillet into oven then roast for 8-15 minutes or until a meat thermometer inserted into the thickest part of the tenderloin reads 140 degrees. Transfer tenderloin to a cutting board then let rest for a minimum of 10 minutes before slicing. 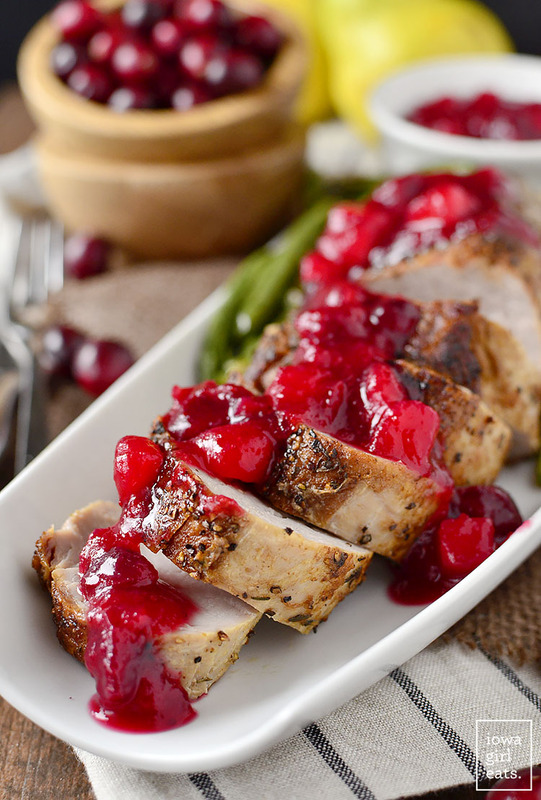 Serve with Cranberry-Pear Sauce. For an easy side dish, turn oven down to 425 degrees after removing pork tenderloin, then roast green beans tossed with extra virgin olive oil and seasonings for 10-15 minutes or until tender. I love my Le Creuset Cast Iron Enameled Skillet for this dish. 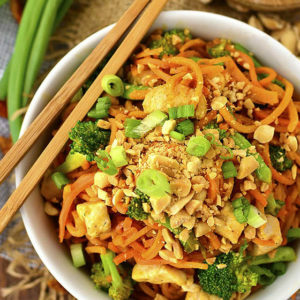 If you like the combo of sweet and savory, you’ll go nuts for this easy and economical dish. Leftovers are absolutely killer straight out of the fridge, too! I hope you enjoy! I grew up thinking I hated pork because it was dry, but when done right, it’s so good. This sounds delicious and, as always, your pictures are stunning! 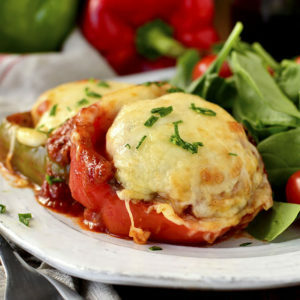 This recipe looks great- I’m thinking of making it tonight :). Question- if I don’t have an oven-proof skillet, could I just use a cookie sheet when it’s time to put the pork in the oven?? Hi Kristi! I would use a 9×13″ baking dish if you have it, or the broiling pan that comes with the oven! What it you don’t have an oven-safe skillet (raises hand). 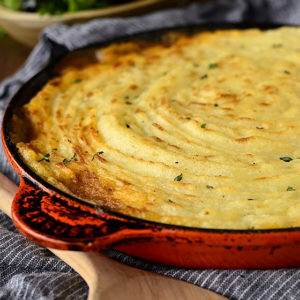 Can I just cook in a regular skillet and transfer to a baking dish? I know I’d lose the yummy stuff from the skillet, but what else could I do? Hi Kathy! I would use a 9×13″ baking dish if you have it, or the broiling pan that comes with the oven. 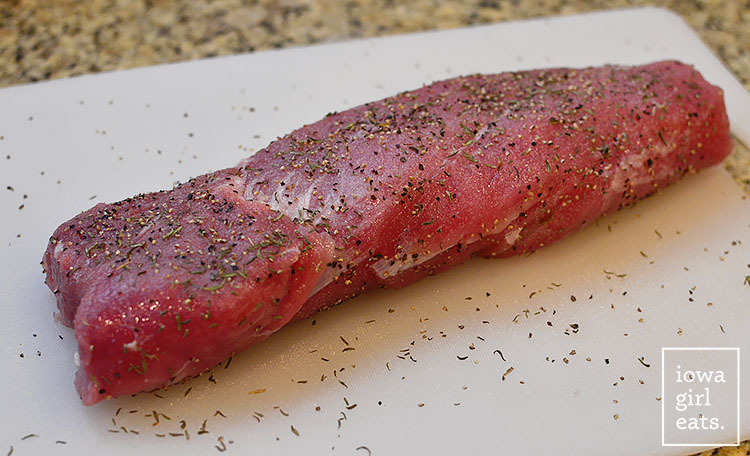 My grandma used to make pork tenderloin every holiday when I was growing up… my husband would request it each time we visited her… now that she is gone, I guess I am going to have to try and make it myself. Thanks for the inspirations! What about apple juice? Apple goes so well with pork, as well as pear and cranberry. I was just thinking that I rarely have pears on hand but I could do peeled apple instead. No problem! I would use 3-4 Tablespoons apple juice or 1-2 Tablespoons white sugar. You are a star!! I have cranberries I need to use and just got pears from the FFA. I think I will make it for the top of the chicken breasts I also need to use. Thank you so much! Looks incredible! What a beautiful dish. I can imagine with pork this sauce tastes delicious! This looks fabulous! I have leftover cranberries in the freezer from thanksgiving, and I just bought a pork tenderloin and pears today! Can’t wait to give this a try! 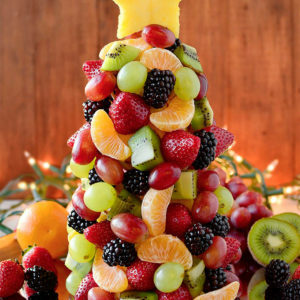 I think this will be served the night after Christmas when we get together with our friends. It does look soooo beautiful! Any ideas of something to substitute for the pear? I’m allergic to apples, pears, peaches, and plums ? but this looks so delicious I really want to try it! Hmmm, maybe really ripe fresh pineapple?? That could be a fun twist! I included timing instructions for roasting green beans in the notes area of the recipe card – mashed or scalloped potatoes would also be really good on the side! This looks amazing!! Can’t wait to try it out. Thanks for the great recipes! Hi Lauren! You can still access the Family channel by clicking on the “Family” link under “Explore” at the bottom of the homepage. I haven’t updated it since Lincoln’s 18 month update – just not 100% sure I’m comfortable putting him on the blog in that kind of format anymore but stay tuned, it could continue in a different way in the future! 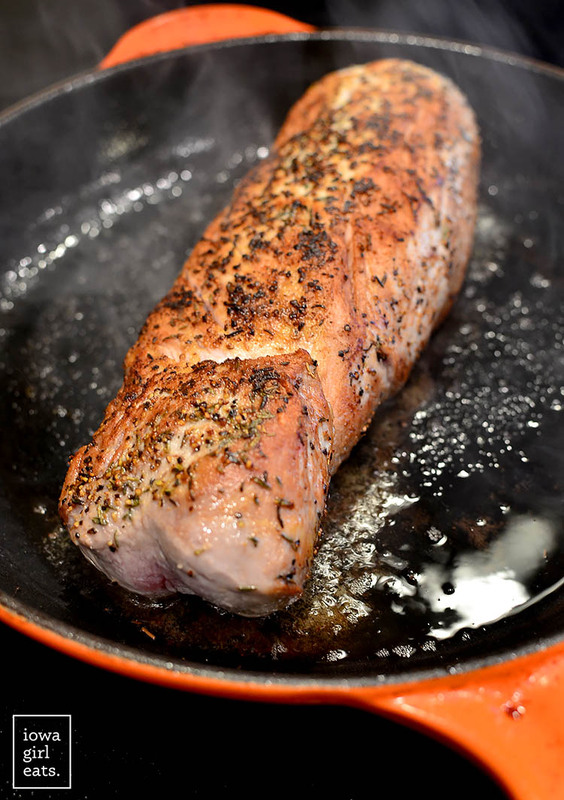 Pork tenderloin is one of my “go to” choices – I love seasoning it with paprika, cayenne, brown sugar. Your recipe sounds equally delicious! What a gorgeous dish! 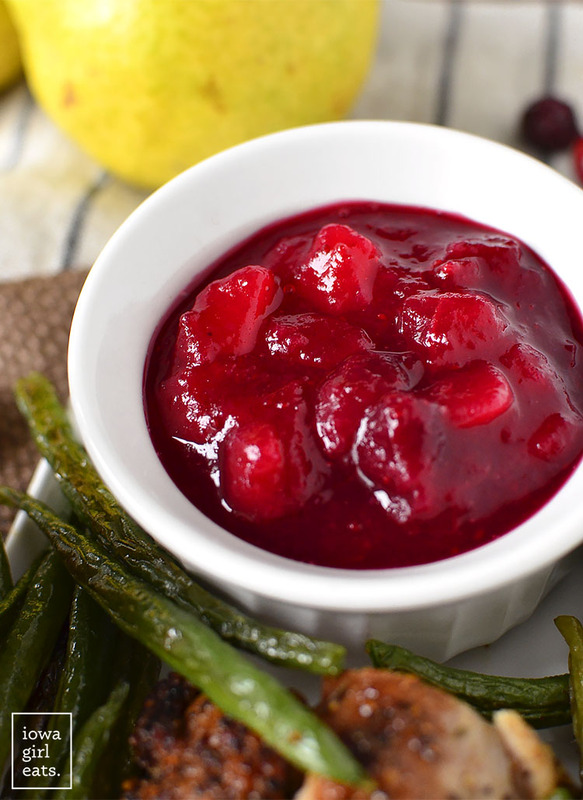 Nothing beats homemade cranberry sauce with fresh cranberries! I made this recipe on the weekend and I just wanted to let you know it was fab-u-lous! The roast was super tender and tasty, and the sauce was delicious! 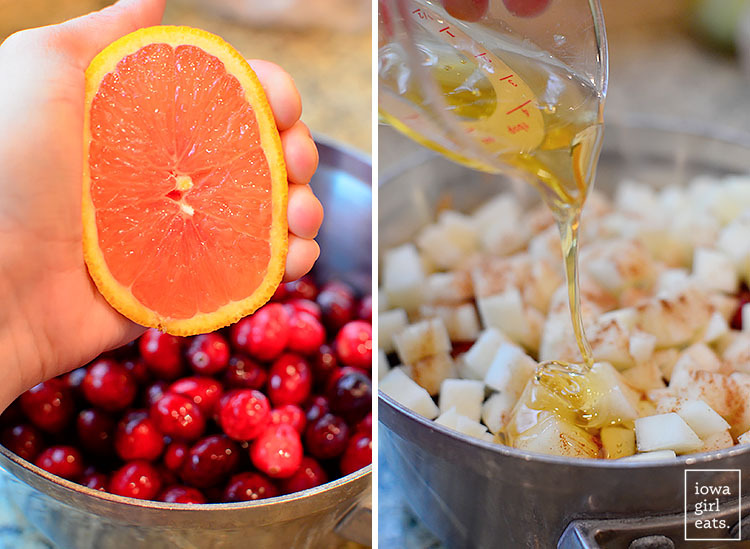 I loved the combo of the tart cranberries with honey. It was just right! So glad to hear it, Christa! Thanks for the great feedback! Ok, so I made this tonight and nailed it! Omg…. It was… Incredible! Thanks a million for posting this. So simple and quick. I did the sauce and the tenderloin, and my family (to include 2 very small, sometimes picky boys) demolished it. Great job here, Kristen! Yay!! So glad to hear – I especially love that little ones ate it up too! The best pork tenderloin I’ve ever made and I’m 62. I used a 9×3 by the way and it worked fine. I couldn’t believe we could cut it and not saw it. I also made the cranberry pear sauce and it was delicious too. Right?! I have definitely sawed many a pork tenderloin in my day too. I think only needing to cook the pork to 140 degrees was a real game changer!